Radiation Environment in a Human Phantom aboard the International Space Station during the Minimum of 23-rd Solar Cycle Semkova J. 1, Koleva R. 1, Maltchev. 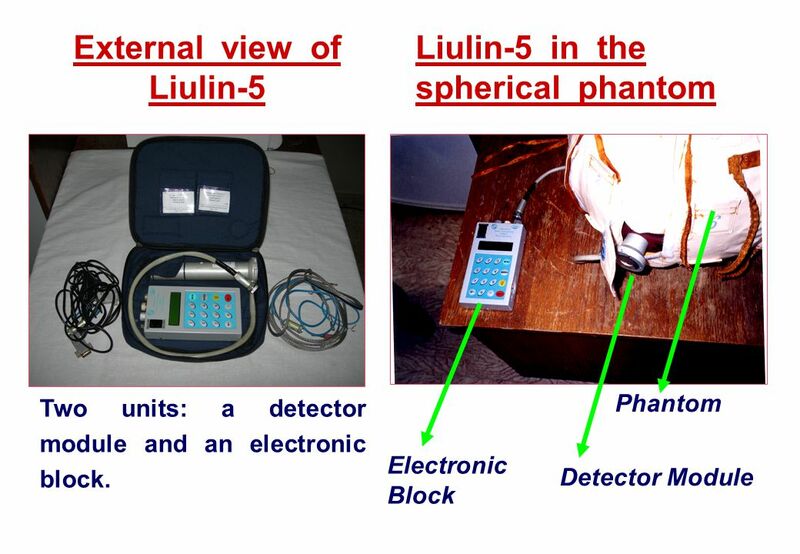 2 INTRODUCTION  Experiment Liulin-5 for investigation of the radiation environment dynamics within the spherical tissue-equivalent phantom on ISS started in June 2007 on RS of ISS. 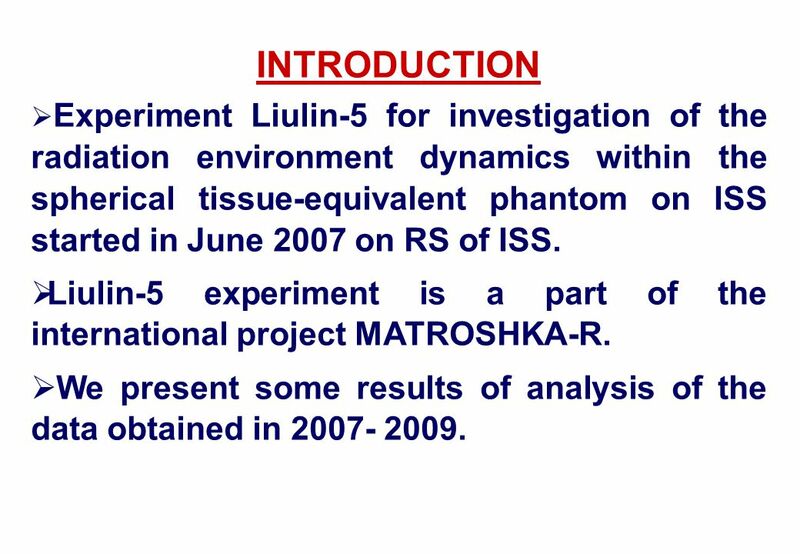  Liulin-5 experiment is a part of the international project MATROSHKA-R.  We present some results of analysis of the data obtained in 2007- 2009. 3 Spherical Tissue – Equivalent Phantom  Size: 370x370x390 mm; mass: 32kg;  Radiation detectors –number of passive detectors and Liulin-5 charged paricle telescope. 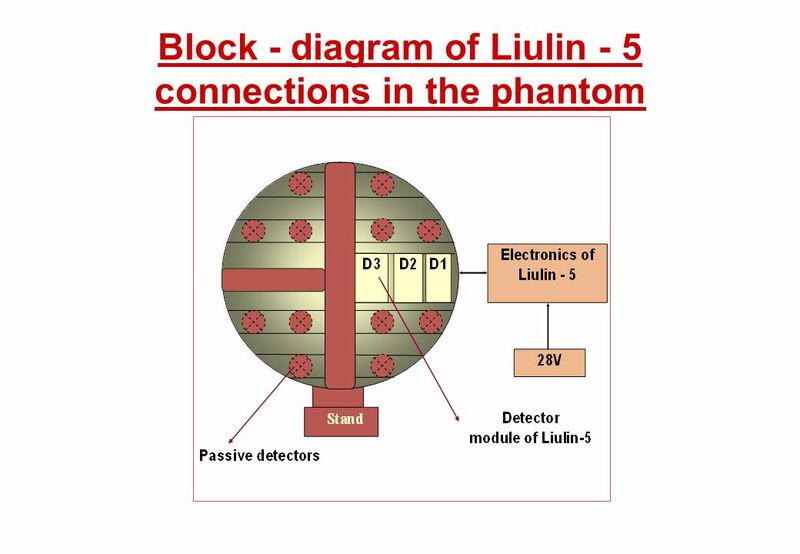  Liulin-5 detector module is placed in a radial channel. 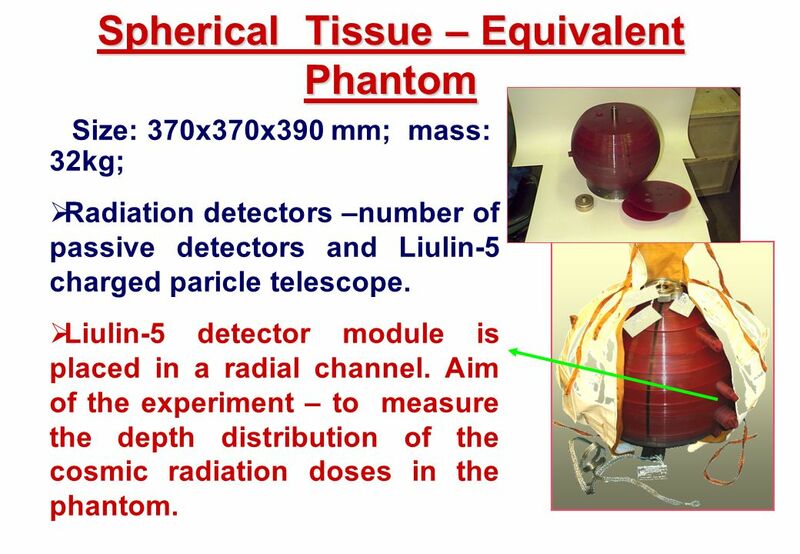 Aim of the experiment – to measure the depth distribution of the cosmic radiation doses in the phantom. 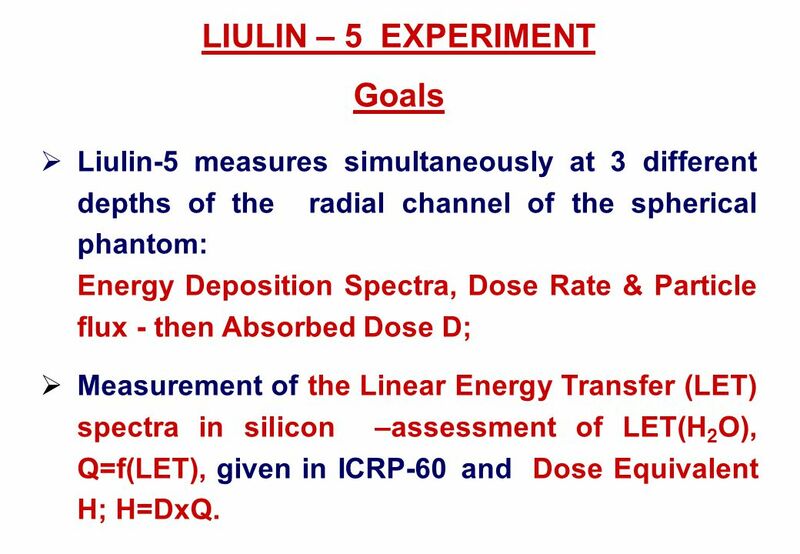 5 LIULIN – 5 EXPERIMENT Goals  Liulin-5 measures simultaneously at 3 different depths of the radial channel of the spherical phantom: Energy Deposition Spectra, Dose Rate & Particle flux - then Absorbed Dose D;  Measurement of the Linear Energy Transfer (LET) spectra in silicon –assessment of LET(H 2 O), Q=f(LET), given in ICRP-60 and Dose Equivalent H; H=DxQ. 6 Phantom Detector Module Electronic Block Liulin-5 in the spherical phantom External view of Liulin-5 Two units: a detector module and an electronic block. 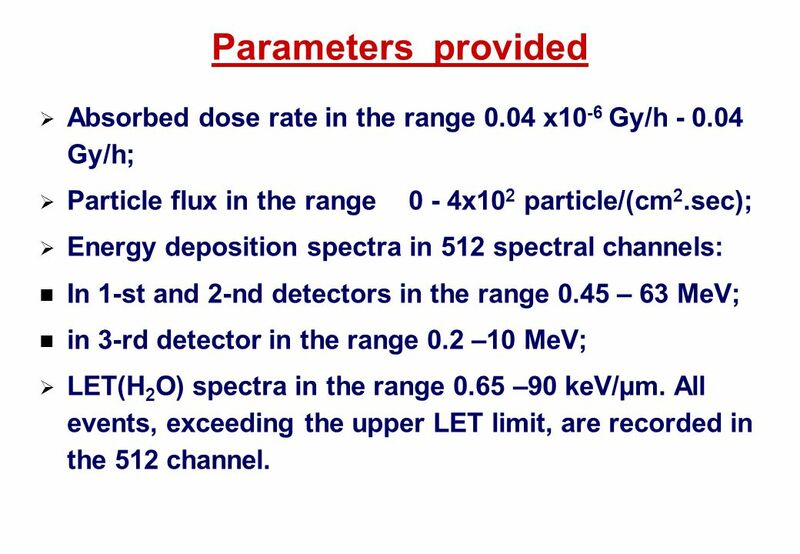 7 Parameters provided   Absorbed dose rate in the range 0.04 x10 -6 Gy/h - 0.04 Gy/h;   Particle flux in the range 0 - 4x10 2 particle/(cm 2.sec);   Energy deposition spectra in 512 spectral channels: In 1-st and 2-nd detectors in the range 0.45 – 63 MeV; in 3-rd detector in the range 0.2 –10 MeV;   LET(H 2 O) spectra in the range 0.65 –90 keV/µm. All events, exceeding the upper LET limit, are recorded in the 512 channel. 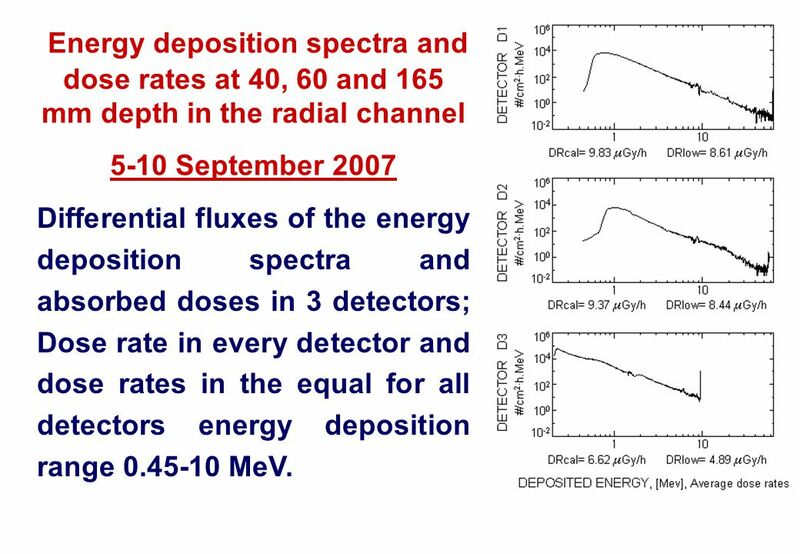 8 Energy deposition spectra and dose rates at 40, 60 and 165 mm depth in the radial channel 5-10 September 2007 Differential fluxes of the energy deposition spectra and absorbed doses in 3 detectors; Dose rate in every detector and dose rates in the equal for all detectors energy deposition range 0.45-10 MeV. 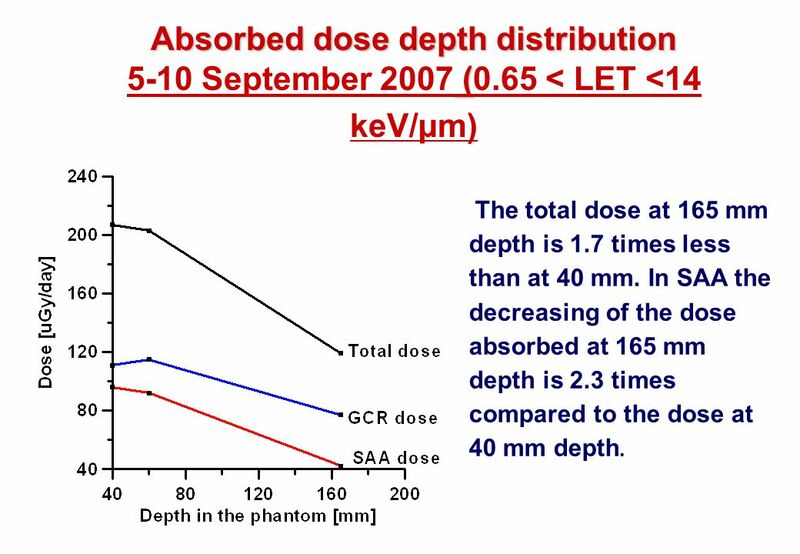 11 Absorbed dose depth distribution ( Absorbed dose depth distribution 5-10 September 2007 (0.65 < LET <14 keV/µm) The total dose at 165 mm depth is 1.7 times less than at 40 mm. In SAA the decreasing of the dose absorbed at 165 mm depth is 2.3 times compared to the dose at 40 mm depth. 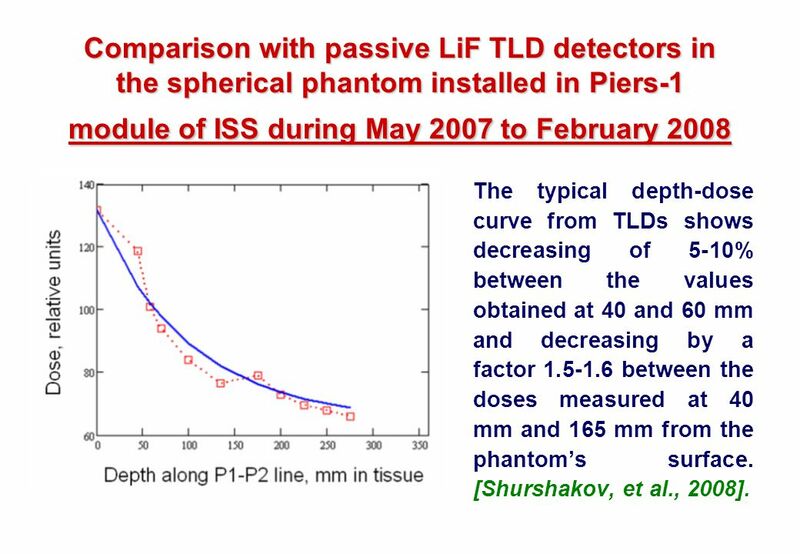 12 Comparison with passive LiF TLD detectors in the spherical phantom installed in Piers-1 module of ISS during May 2007 to February 2008 The typical depth-dose curve from TLDs shows decreasing of 5-10% between the values obtained at 40 and 60 mm and decreasing by a factor 1.5-1.6 between the doses measured at 40 mm and 165 mm from the phantom’s surface. [Shurshakov, et al., 2008]. 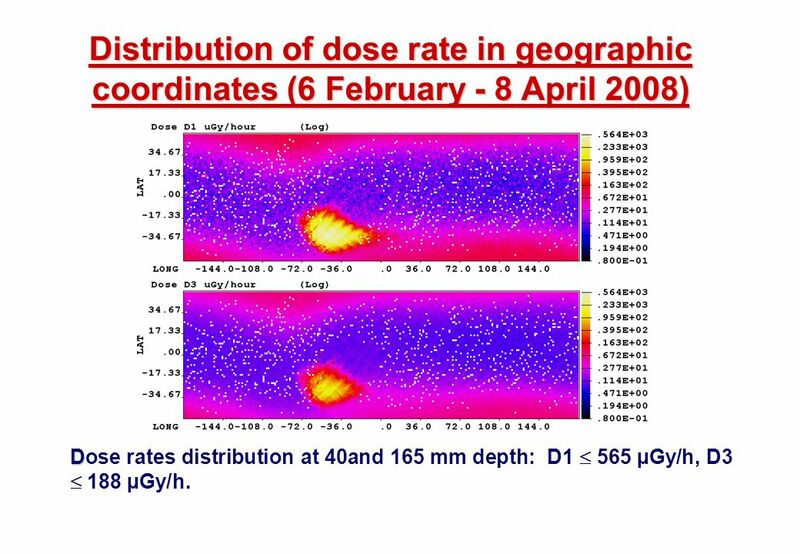 13 Distribution of dose rate in geographic coordinates (6 February - 8 April 2008) Dose rates distribution at 40and 165 mm depth: D1  565 µGy/h, D3  188 µGy/h. 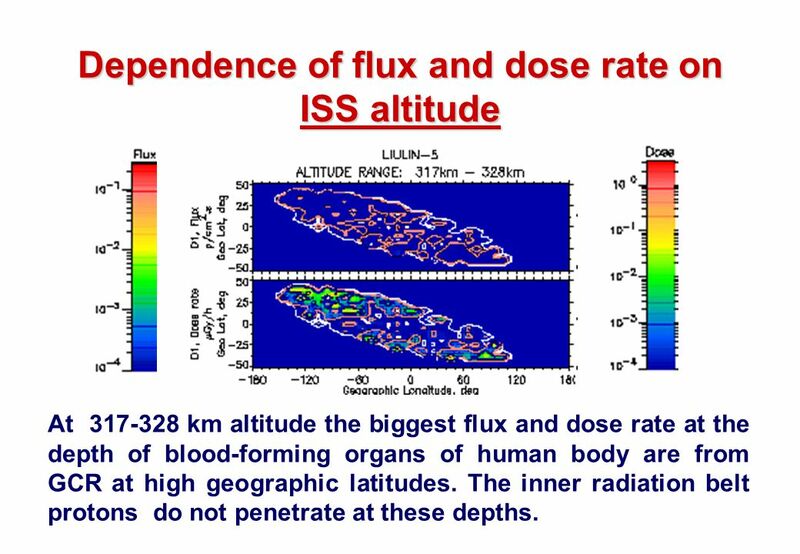 14 Dependence of flux and dose rate on ISS altitude At 317-328 km altitude the biggest flux and dose rate at the depth of blood-forming organs of human body are from GCR at high geographic latitudes. The inner radiation belt protons do not penetrate at these depths. 15 Last data-August 2009 Data for 26- 28.08.2009, D2 (black) and D3 (red). 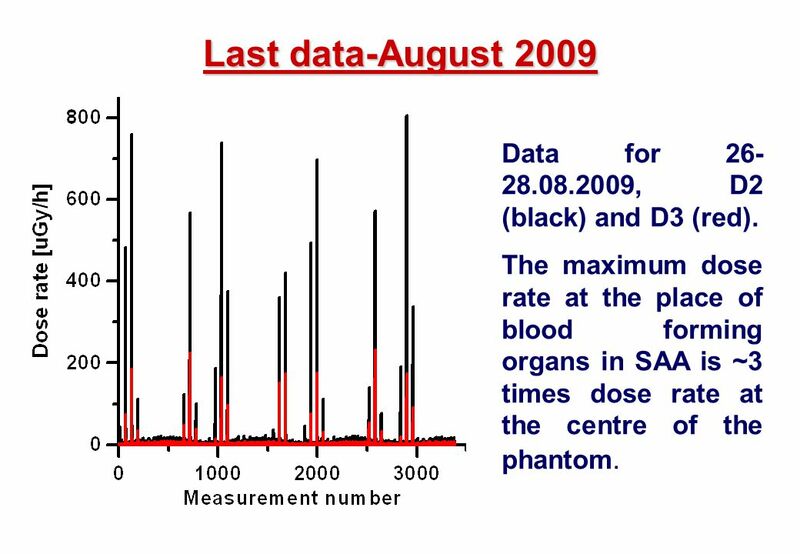 The maximum dose rate at the place of blood forming organs in SAA is ~3 times dose rate at the centre of the phantom. 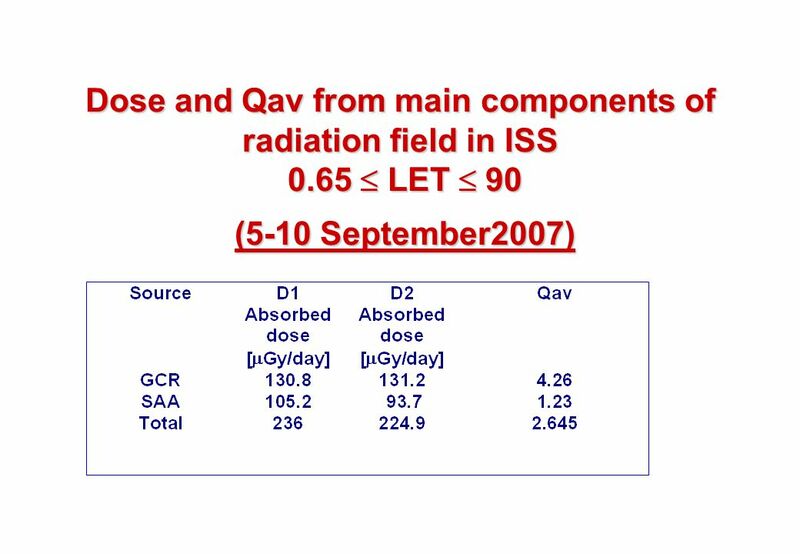 16 Averaged daily doses and dose equivalents in the range 0.65  LET  90 keV/µm, measured at BFO (3-10 July 2007) SAA Qav =1.3 GCR Qav =4.7 Total Qav=3.2 Detector D [µGy/day] Dose[µSv/day] Dose[µSv/day] Dose[µSv/day] D1102.3134.5125.4 594.5 227.7728.6 D2D2D2D286.8114.1123.9 587.3 210.7701.4 Absorbed doses from both sources at depths of blood forming organs in human body are nearly the same. The contribution of the trapped radiation is only 16-18% of total dose equivalent; the rest is from GCR and their secondary radiation. 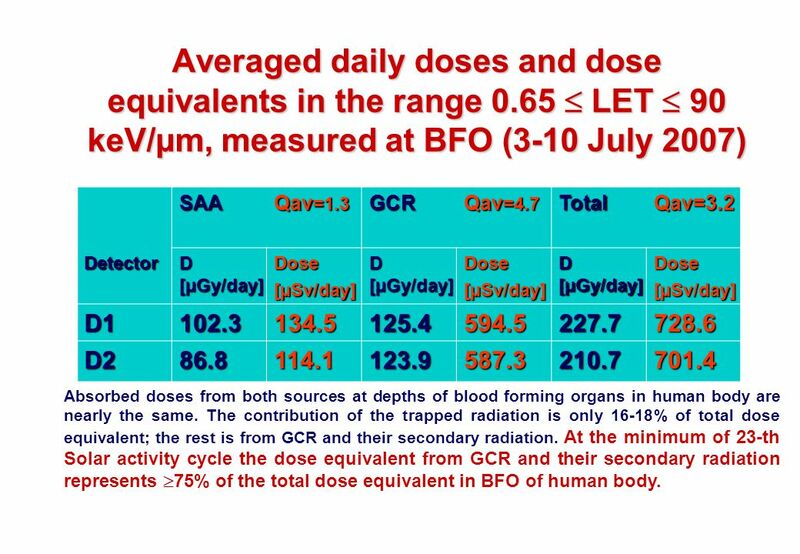 At the minimum of 23-th Solar activity cycle the dose equivalent from GCR and their secondary radiation represents  75% of the total dose equivalent in BFO of human body. 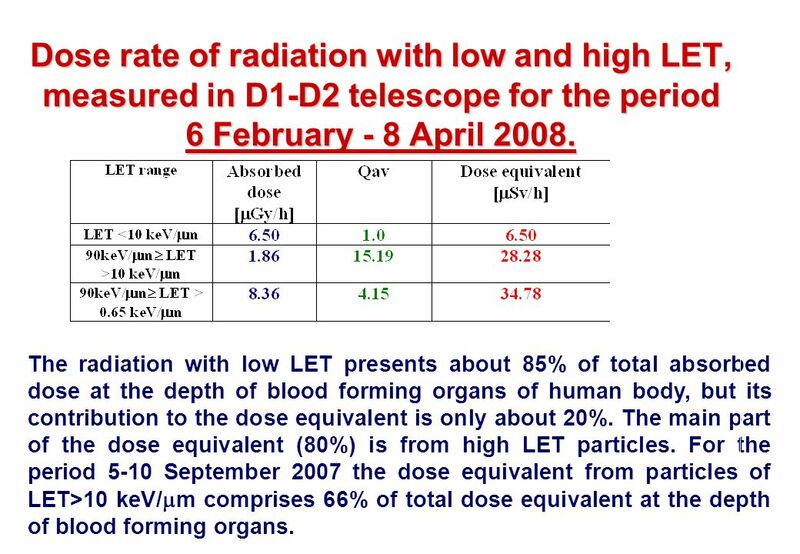 17 Dose rate of radiation with low and high LET, measured in D1-D2 telescope for the period 6 February - 8 April 2008. The radiation with low LET presents about 85% of total absorbed dose at the depth of blood forming organs of human body, but its contribution to the dose equivalent is only about 20%. The main part of the dose equivalent (80%) is from high LET particles. For the period 5-10 September 2007 the dose equivalent from particles of LET>10 keV/  m comprises 66% of total dose equivalent at the depth of blood forming organs. 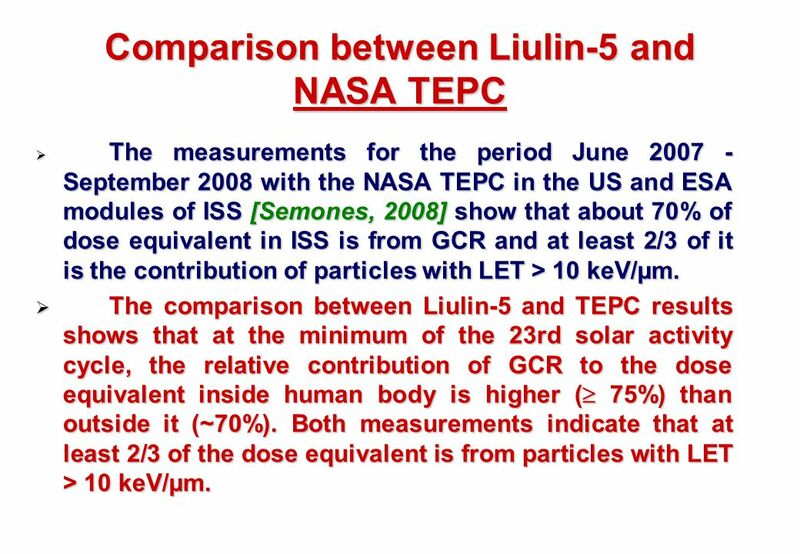 18 Comparison between Liulin-5 and NASA TEPC  The measurements for the period June 2007 - September 2008 with the NASA TEPC in the US and ESA modules of ISS [Semones, 2008] show that about 70% of dose equivalent in ISS is from GCR and at least 2/3 of it is the contribution of particles with LET > 10 keV/µm.  The comparison between Liulin-5 and TEPC results shows that at the minimum of the 23rd solar activity cycle, the relative contribution of GCR to the dose equivalent inside human body is higher (  75%) than outside it (~70%). Both measurements indicate that at least 2/3 of the dose equivalent is from particles with LET > 10 keV/µm. 19 CONCLUSION (1) ISS orbital parameters. 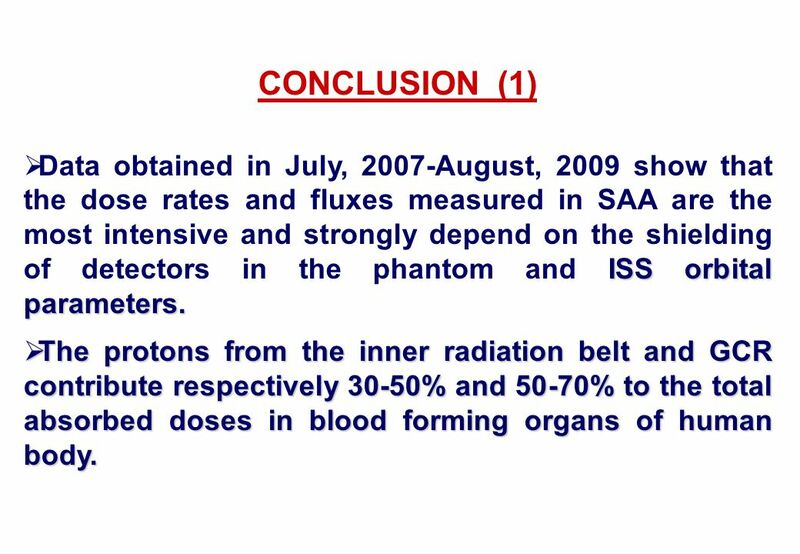  Data obtained in July, 2007-August, 2009 show that the dose rates and fluxes measured in SAA are the most intensive and strongly depend on the shielding of detectors in the phantom and ISS orbital parameters.  The protons from the inner radiation belt and GCR contribute respectively 30-50% and 50-70% to the total absorbed doses in blood forming organs of human body. 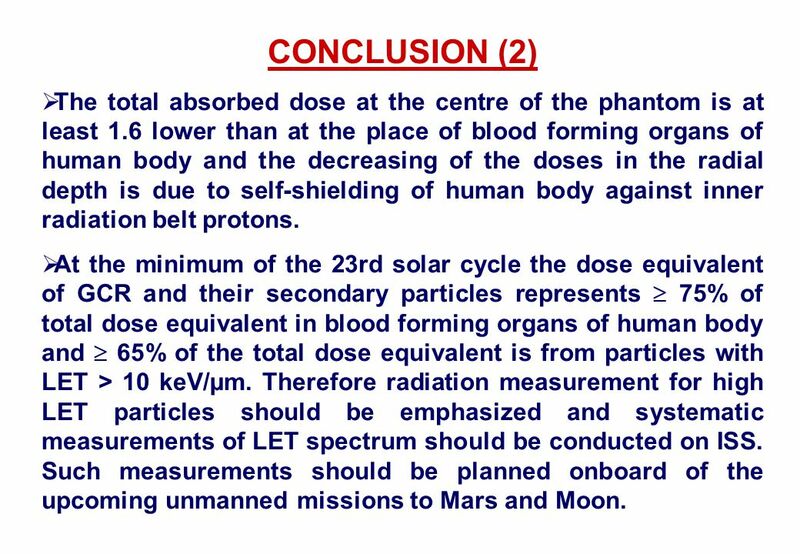 20 CONCLUSION (2)  The total absorbed dose at the centre of the phantom is at least 1.6 lower than at the place of blood forming organs of human body and the decreasing of the doses in the radial depth is due to self-shielding of human body against inner radiation belt protons.  At the minimum of the 23rd solar cycle the dose equivalent of GCR and their secondary particles represents  75% of total dose equivalent in blood forming organs of human body and  65% of the total dose equivalent is from particles with LET > 10 keV/µm. Therefore radiation measurement for high LET particles should be emphasized and systematic measurements of LET spectrum should be conducted on ISS. Such measurements should be planned onboard of the upcoming unmanned missions to Mars and Moon. 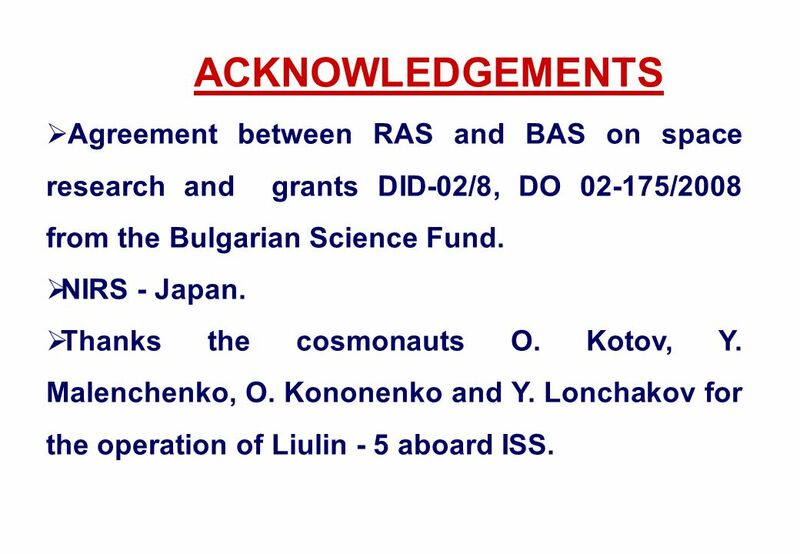 21 ACKNOWLEDGEMENTS  Agreement between RAS and BAS on space research and grants DID-02/8, DО 02-175/2008 from the Bulgarian Science Fund.  NIRS - Japan.  Thanks the cosmonauts O. Kotov, Y. Malenchenko, O. Kononenko and Y. Lonchakov for the operation of Liulin - 5 aboard ISS. 22 REFERENCES  Semkova J. et al. Adv. Space Res., 45, 2010, No 7, 858- 865.  Semones E. Thirteenth WRMISS Workshop, Krakow, Poland, http://wrmiss.org/workshops/thirteenth/Semones_TEPC. pdf, 8-10 September 2008  Shurshakov V. et al. 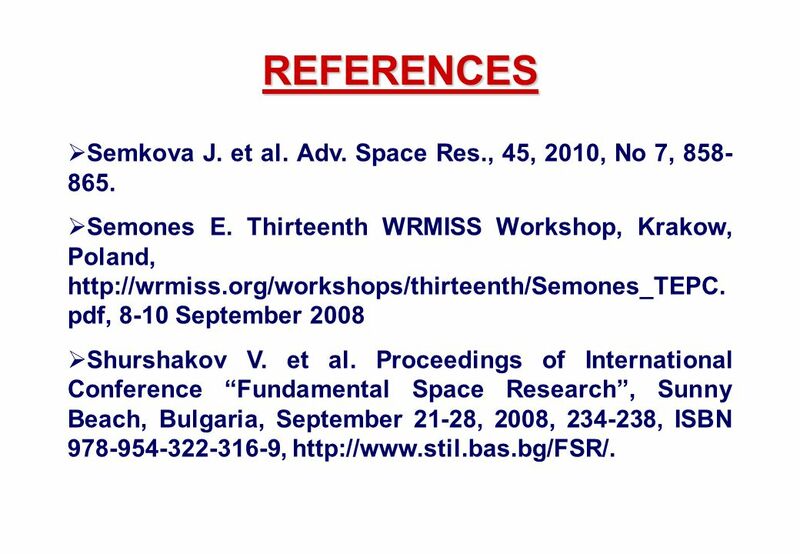 Proceedings of International Conference “Fundamental Space Research”, Sunny Beach, Bulgaria, September 21-28, 2008, 234-238, ISBN 978-954-322-316-9, http://www.stil.bas.bg/FSR/. 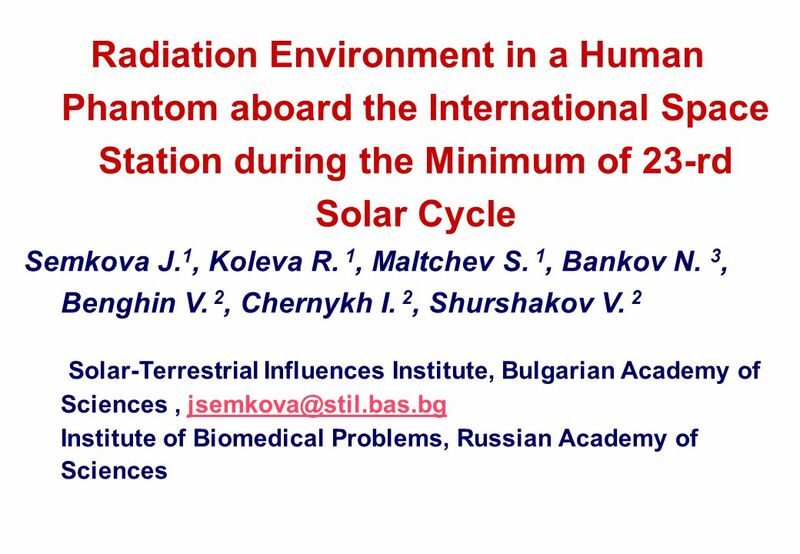 Download ppt "Radiation Environment in a Human Phantom aboard the International Space Station during the Minimum of 23-rd Solar Cycle Semkova J. 1, Koleva R. 1, Maltchev." BELGISCH INSTITUUT VOOR RUIMTE-AERONOMIE INSTITUT D’AERONOMIE SPATIALE DE BELGIQUE BELGIAN INSTITUTE FOR SPACE AERONOMY BELGISCH INSTITUUT VOOR RUIMTE-AERONOMIE. New results of radiation environment investigation by Liulin-5 experiment in the human phantom aboard the International Space Station. 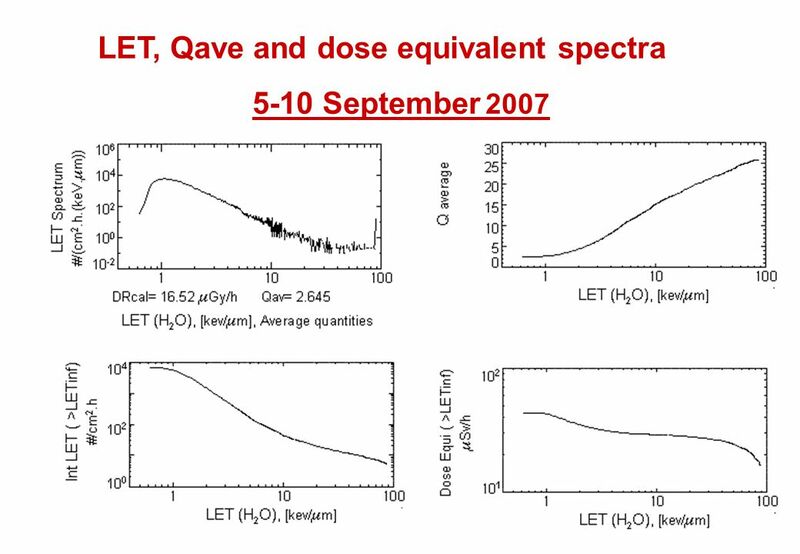 DOSE SPECTRA FROM ENERGETIC PARTICLES AND NEUTRONS (DoSEN) S. Smith 1, N. A. Schwadron 1 C. Bancroft 1, P. Bloser 1, J. Legere 1, J. Ryan 1, H. E. Spence. Recent Observations of Space Radiation Characteristics in a Tissue- Equivalent Phantom onboard International Space Station by Liulin-5 Dosemetric Telescope. Investigation of daily variations of cosmic ray fluxes in the beginning of 24 th solar activity cycle Ashot Chilingarian, Bagrat Mailyan IHY-ISWI Regional. S. Della Torre 1,2, P. Bobik 5, G. Boella 1,3, M.J. Boschini 1,4, C. Consolandi 1, M. Gervasi 1,3, D. Grandi 1, K. Kudela 5, F. Noventa 1,3, S. Pensotti. NASA 2001 Mars Odyssey page 1 Workshop HEND Institute for Space Research, June , 2003 BTN – HEND analog on International Space Station (Application. Analysis of Mercury’s X-ray fluorescence M. Laurenza, M. Storini and A. Gardini IFSI-INAF, Via del Fosso del Cavaliere, 100, Rome 00133, Italy Joint SERENA. Results from the GIOVE-A CEDEX Space Radiation Monitor B Taylor 1, C Underwood 1, H Evans 2, E Daly 2, G Mandorlo 2, R Prieto 2, M Falcone 2 1. Surrey. Radiation hazard to astronauts on Low-Earth Orbit Monika Puchalska (on behalf of the Polish MATROSHKA group) Department of Radiation Physics and Dosimetry. Further development of modeling of spatial distribution of energetic electron fluxes near Europa M. V. Podzolko 1, I. V. Getselev 1, Yu. I. Gubar 1, I. 21 ECRS, Kosice, 12/09/2008 Trapped charge particles measurements in the radiation belt by PAMELA instrument Vladimir V. Mikhailov (MEPHI) for PAMELA collaboration. D E S I R E Dose Estimation by Simulation of the ISS Radiation Environment Geant4 simulations of the Columbus/ISS radiation. GSEM project SPENVIS/GEANT4 Workshop, Leuven, Belgium, October 2005 Daniel Haas, DPNC Genève Outline Description of GSEM HEP Range Telescope Radiation. Danish Space Research Institute Danish Small Satellite Programme FH Space_Environment.ppt Slide # 1 Flemming Hansen MScEE, PhD Technology Manager. Space radiation dosimetry and the fluorescent nuclear track detector Nakahiro Yasuda National Institute of Radiological Sciences.